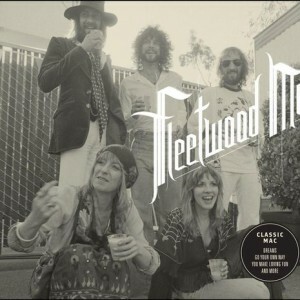 Featuring songs running from 1975 on up to 1987, Starbucks gives Fleetwood Mac their Opus Collection treatment. The tunes here are great, mostly hits, from opener “You Make Loving Fun” (one of four from arguably the biggest Mac album, 1977’s Rumours) to the floaty, yet beautiful Stevie Nicks’ plinkly enchantment of “Gypsy” from Mirage, the equally beautiful, yet sad “Sara” from Tusk (there is an interesting inclusion of the upbeat Christine McVie-led poppy electric piano “Honey Hi” from Tusk too, a song I doubt has ever been considered for a “best of” collection) to the hits “Little Lies” and “Everywhere” from Tango In the Night. While a song like the ’50s-flavored Lindsey Buckingham “Oh Diane” is kind of a waste of time (especially on a short we’re-not-calling-this-a-greatest-hits-collection-yet-that’s-what-this-is record) when you get “Landslide,” “Rhiannon” and “World Turning” on one disc, you can’t truly complain. I can’t speak to the caffeinated wisdom of foisting this package on the public, but the quality of sound here is on the high-end of digital (which of course is like making a silk purse out of a sow’s ear) and with Rolling Stone scribe David Wild penning the liner notes, one is getting a solid bang for one’s buck. The real gem is the last tune, maybe worth the price of this record, “Planets Of the Universe (Demo),” from the Rumours re-issue of 2004. It’s a Stevie Nicks torch-er, Mick Fleetwood’s subtle drumming and Stevie’s deep singing masking some overplaying by Lindsey Buckingham.